I don't think it will come as a surprise to you all when I tell you that I REALLY like cake, I mean as long as you put fruit it then it can even become one of your five-a-day right? And I mean I don't just like cake because it tastes good (and that of course puts me in a good mood), no I also enjoy everything cake like because it means I can bake them with my children and what better activity to do together with your kids when you get such a delicious ending! 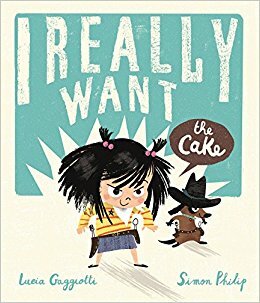 So of course when I was emailed and asked if I would like to take a look at Simon Philip's latest picture book, I Really Want the Cake, well I could hardly resist now could I. How on earth do you resist the most amazing cake? One little girl is about to find out just how hard that can be. Well straight away, just from reading the blurb I knew that I could relate to this tale. Anyone that has been on a diet, or tried to cut some sort of junk food out will know just how hard it can be to say no, I swear I've heard cake calling to me from the kitchen before and it's taken all of my will power to resist the spongy goodness and the sugary icing. My mouth is now watering as I write this and I feel the need to eat cake as I review this book. Anyway I digress, this story isn't actually about me, it is about a little girl who quite rightly really wants the cake. What I like about this book is that you can make more of it. As you turn the pages it talks about how the cake smells, how it looks, how it could taste. This is something that could be used in a lesson about senses. What do you think the cake would taste like, how would you imagine it smelling, what would it feel like when you take a bite after not being able to resist cutting a rather big slice out of that oh so tempting cake. Then of course there is the all important question, would you be able to resist the cake? As you turn the pages of the book, you are entertained by the illustrations that go alongside the words to this tale. It makes for quite a funny read for both the parents and the children enjoying it because whether young or old and whether it's cake you quite fancy or another food entirely, I think we've all experienced that certain feeling of desire and can relate to this cute yet mischievous child. And how do we resist such delights because we all know when we are told not to do something or that we can't have something that we instantly crave it more, it's like there's something built within us that says we must break these rules. In the case of the cake well it seems distraction is the key. This of course can lead to another discussion about the things we can do to distract ourselves. The little girl plays, she reads but with every distraction you can see that she's becoming a little bit more frustrated, that her resolve and will power are not remaining as strong as they should but she must . . . I'm sure you can all guess what might happen next but I won't tell you because you may just be surprised. An added bonus for this tale is that a cake recipe is included at the back. And what's a good activity to do together as a family, a part from reading, well baking of course. So if you really want cake after reading this scrumptious tale you can go on and make yourself some but you must try really hard to not eat it all at once.